For the inaugural post to the GoldSim Blog, I thought it would be fun to go back in time and provide a history lesson. Where did GoldSim come from? Why was it developed? Who got the ball rolling? Who were the first users? For those of you interested in such ancient history, this post will describe the early history of GoldSim from its origins in the late 1980s to the formation of the GoldSim Technology Group (GTG) in 2004. The GoldSim story starts in the late 1980s. Golder Associates, an international engineering consulting firm, was involved in a wide variety of radioactive waste management projects worldwide. This push was led by David Pentz, who eventually became the Chairman of Golder Associates, and Ian Miller, an engineer with expertise in environmental modeling and probabilistic simulation. David, Ian and others at Golder had been involved in evaluating a number of potential sites for radioactive waste disposal for a number of government organizations. A key part of evaluating the safety of a proposed repository is a performance assessment of the system. A performance assessment is a quantitative evaluation of the expected long-term performance (typically in terms of impacts, such as doses to the public) of a proposed facility. Golder was involved in supporting a number of such assessments. At that time, however, there was no standard tool or approach for carrying out such an analysis (and hence many customized codes were developed worldwide for the various sites under consideration). In 1987, the site at Yucca Mountain Nevada was selected by Congress as the only site to be studied for the nation’s first high level radioactive waste repository. At this time, the US national laboratories and many contractors were busy studying the site, and were developing a Site Characterization Plan for carrying out the analysis of the site. In order to manage and evaluate this plan, the US Department of Energy (DOE) required some defensible way to evaluate (and defend) what should be studied and just as importantly, when the amount of data collected was sufficient (i.e., what is the value of the information?). Golder Associates was contracted to assist with this. To carry this out, what was required was a system-level probabilistic performance assessment tool. What Golder wanted to do was create a tool that could show how reducing the uncertainty in any of the key processes or parameters reduced the uncertainty in the predicted performance of the facility. To build this tool, Ian assembled and led a team of engineers and programmers. This group included myself, Mark Cunnane, Warren Jones and Bill Fuget. In late 1990, we convened a number of workshops with members of the scientific community studying Yucca Mountain (primarily national laboratory staff) to obtain input on the key features, events and processes that would need to be included in such a model, and to better understand the current state-of-the-art in performance assessment tools. The end product of this effort (in early 1991) was RIP (Repository Integration Program). RIP was a DOS program. Its user interface was programmed in Turbo Pascal, and its computational engine was programmed in C. Although the program was originally developed as a tool to prioritize what DOE should study, DOE also needed a tool to start making performance predictions to eventually support a license application for the site. Although others had been working on the problem, no other viable tools existed, and RIP was selected by the Yucca Mountain contractor (TRW) as the performance assessment code for the site. 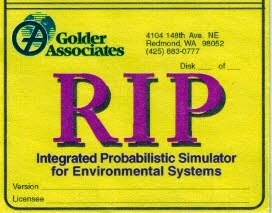 Golder (Ian and I) built the first probabilistic performance assessment model of the site using RIP in 1992, and the Yucca Mountain project subsequently produced as long series of models using RIP soon after. The United States was not the only country dealing with radioactive waste management issues; many other government organizations around with world faced similar problems, and they all needed a performance assessment tool. One of the first organizations to start using RIP outside of the US was the Spanish radioactive waste management program ENRESA. In 1992, I spent four months in Madrid building a performance assessment model for ENRESA. At the same time, Golder engineers in England were applying RIP to the UK’s proposed disposal facility. Over the next several years, as RIP continued to be used at Yucca Mountain, its use continued to grow in other radioactive waste management programs around the world, ranging from Japan to Canada to Hungary. In the US, it was used at a number of proposed low-level radioactive sites (e.g., in New York and Illinois). It was also applied to the WIPP facility in New Mexico (as a separate, independent calculation to that being carried out by Sandia National Laboratories to license the facility). Over these first several years, it became clear that the problem-solving approach incorporated into RIP (system-level, top-down, probabilistic analysis) should be applied to other complex problems. One such problem is the planning and execution of large, complex projects. One particular large project of great importance at that time was the licensing and construction of the Waste Isolation Pilot Plant (WIPP) facility in New Mexico. WIPP was designed to permanently dispose of transuranic radioactive waste left from the research and production of nuclear weapons. To support this, Ian led much of the same team that assembled RIP to build a similar tool (borrowing much of the infrastructure already developed for RIP) to attack this problem. This new tool, called STRIP (Strategy Integration Program), was also used to simulate complex systems explicitly accounting for uncertainty. However, rather than modeling a physical system like RIP (a repository), STRIP was designed to model complex projects and predict their likelihood of success. Ian and others (in particular, Alan Keizur, a recent hire and Charlie Voss) applied STRIP to the WIPP project to evaluate alternative licensing strategies for the facility. There was one other key development in the 90s that would (unexpectedly) have a critical impact on the eventual development of GoldSim. In 1995, soon after reunification, Germany was faced with cleaning up the legacy of many decades of uranium mining (the former German Democratic Republic produced much of the uranium for the Soviet Union). A state-owned German company named WISMUT, the company that originally mined the uranium, was now responsible for cleaning up and closing the various uranium mining facilities. Among other things, this required quantitative evaluation of various alternatives for remediating and closing the facilities (in terms of measures such as environmental impact, cost and economic impacts). Charlie Voss, who had lots of experience in radioactive waste management, was successful in convincing WISMUT that RIP would be the perfect tool for the job. Over the next several years, RIP was successfully applied to numerous sites (with Charlie and I making many long trips to eastern Germany). Although the successful use of RIP at WISMUT was significant (in fact, GoldSim is still used there today), of far greater significance was the fact that during this period, WISMUT happened to employ a young software engineer by the name of Stefan Knopf. Stefan approached Charlie, expressing his interest in joining Golder in the US. 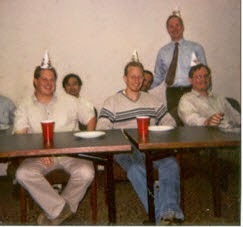 In the spring of 1998, Stefan arrived in Redmond to work for Golder. He went on to become one of the driving forces behind GoldSim (as one of the founders of GTG and the Chief Programmer). Stefan was specifically hired to help convert RIP (a DOS program) to a Windows program. While designing this, however, it was recognized that this new program should be a very general-purpose tool, not a tool that was focused on a specific application (like RIP and STRIP). The idea was to develop a general purpose dynamic, probabilistic simulation framework that could be applied to a wide range of complex problems (not just radioactive waste management). The development team, in addition to Ian, Stefan and I, included Jeremy Schwartzentruber, Bill Fuget, Glori Lee and Andy Thomas. The new software needed a name. Alan Keizur suggested GoldSim, and it stuck. (I suggested SimRex, with a T Rex logo, but this was roundly mocked and quickly shot down, and remains a sore point with me to this day J). The first version of GoldSim was produced in late 1999. 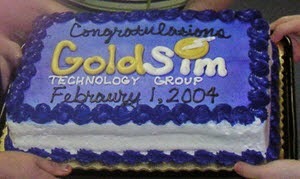 Launch party for GoldSim, 1999. Within Golder, early users and promoters of GoldSim (in addition to Ian and I) were Charlie Voss, Alan Keizur, Dave Hoekstra (Denver), Mark Nutt (Washington, DC) and various Golder staff in Nottingham and Hungary. Outside of Golder, early adopters included the Yucca Mountain Project, the Spanish radioactive waste management agency (Enresa), the Japanese radioactive waste management agency (JNC, now JAEA), Wismut (primarily Rene Kahnt), and Neptune and Company (John Tauxe and Paul Black). As the use of GoldSim spread starting in about 2000, its use continued to grow within the radioactive waste management community (e.g., Hungary, Canada, Japan, France, Germany, the UK, Slovak Republic, Czech Republic, Taiwan). However, more importantly, its use grew in a variety of other arenas, most importantly mining. In addition, a growing number of engineering firms became interested in using GoldSim, and the software also started to be discovered by people outside of the civil and environmental community (e.g., Caterpillar) and used for applications such as business modeling. As interest in the software grew, it became increasingly clear to us that for a variety of reasons, it would be difficult to grow a software business within a large engineering consulting firm that focused primarily on the earth and environmental arenas. As a result, in 2003, Ian, Stefan and I began a series of discussions with Golder management that culminated in the three of us purchasing the GoldSim software from Golder and starting a new independent company, the GoldSim Technology Group, on February 1, 2004. When we spun out, the company consisted of the three founders, another programmer (Alan Sonnenberg, who joined us in 2003 while still with Golder), and an administrative assistant. Although we’ve moved a couple times, our office has always been in Issaquah, Washington (about 10 miles from the Golder office from which we were birthed). In February 2004, we had about 50 customer organizations worldwide. Currently, we have almost 600 in over 40 countries. So that summarizes the “birth of GoldSim”. If you have any memories or additions, please add a comment. We would love to hear from you!